Two blasts have taken place near a school in the city of Kizlyar in Russia’s Southern Republic of Dagestan. Twelve people, including the local police chief, are reported killed, and about thirty people injured. Nine of those killed by the blasts were police officers, and two were alleged terrorists. Russian news agencies report that the explosion took place on Moskovskaya Street, near Kizlyar School No 1 and the headquarters of the local police and security service. A moving car exploded early in the morning, when there were no children in the school. When a police detail arrived at the scene of the blast and spectators started gathering, a man dressed as a police officer rushed into the crowd and triggered an explosive device strapped to his body. The second blast caused numerous casualties among the law enforcers. The blasts happened within 20 minutes of each other. The Russian police have stepped up security measures across the country following two blasts in the Moscow Metro on Monday, March 29. The Metro blasts killed 39 people and injured 95, according to the latest updates. At a government session on Wednesday, Prime Minister Vladimir Putin said he does not rule out the idea that the terror acts in the Moscow Metro and the city of Kizlyar are related. “I do not exclude that the same bandits are behind both acts,” he said. Aleksey Mukhin, the head of the Political Information Center in Moscow, says the battle with insurgents in the North Caucasus is on the rise and spreading. “A terrorist war is being waged now not just in the media. 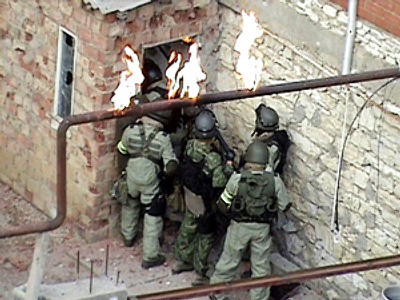 Over the past year, this war went on among terrorist groups and the law enforcement bodies of Ingushetia and Dagestan. This war is fierce and leads to deaths both among law enforcers and guerillas. The situation is escalating now and will continue to do so. Strange as it may seem, the financial crisis has very seriously affected the budgets and the level of financing for terrorist groups, which are now trying to get money in any way possible,” he said. Meanwhile the Interior Ministry of Dagestan has announced the name of one of the suicide bombers in Kizlyar; it was committed by a local resident called Daud Jabrailov. The Republic of Chechnya has offered its help to Dagestan in its fight against terror and militants. “We are ready to provide any help, and we can wipe out this evil only by uniting our efforts,” Chechen President Ramzan Kadyrov told his Dagestani counterpart. The attack in Kizlyar and Monday’s explosions in the Moscow Metro is clearly a sign of an upsurge of terrorist activity, though it is not clear what exactly is going on, shared Tim Wall, the Editor-in-Chief of the Moscow News. There are two things that could have reduced Islamic terrorism internationally, believes Wall, and they are the withdrawal of US and NATO troops from Iraq and from Afghanistan. Wall noted that if those two things would happen “we would see a general lessening of international tensions between radical Muslims and the rest of the world." Ekaterina Kuznetsova, a political scientist from the Moscow-based Center for Post-Industrial Studies, says we have to dig deep into the reasons for these acts of terror. “Of course these acts had very big attention from mass media, but these things are happening at least every week in the Caucasus. I think we have to pay more attention to the situation inside the Caucasus and maybe to revise the ongoing policy towards this region,” she said.